You are more likely to have high blood pressure as you get older. This is because your blood vessels become stiffer as you age. When that happens, your blood pressure goes up. When is Your Blood Pressure a Concern? If your blood pressure is high, you need to lower it and keep it under control. Your blood pressure reading has 2 numbers. One or both of these numbers can be too high. The top number is called the systolic blood pressure. For most people, this reading is too high if it is 140 or higher. The bottom number is called the diastolic blood pressure. For most people, this reading is too high if it is 90 or higher. The above blood pressure numbers are goals that most experts agree on for most people. For people age 60 years and above, some health care providers recommend a blood pressure goal of 150/90. Your provider will consider how these goals apply to you specifically. Older adults tend to take more medicines and this puts them at greater risk for harmful side effects. One side effect of blood pressure medicine is an increased risk for falls. When treating older adults, blood pressure goals need to be balanced against medicine side effects. Limit the amount of sodium (salt) you eat. Aim for less than 1,500 mg per day. Limit how much alcohol you drink, no more than 1 drink a day for women and 2 a day for men. Eat a heart-healthy diet that includes the recommended amounts of potassium and fiber. Stay at a healthy body weight. Find a weight-loss program, if you need it. Exercise regularly. Get at least 40 minutes of moderate to vigorous aerobic exercise at least 3 to 4 days a week. Reduce stress. Try to avoid things that cause you stress, and try meditation or yoga to de-stress. Your provider can help you find programs for losing weight, stopping smoking, and exercising. You can also get a referral to a dietitian from your provider. The dietitian can help you plan a diet that is healthy for you. Your provider may ask you to keep track of your blood pressure at home. Make sure you get a good quality, well-fitting home device. It is best to have one with a cuff for your arm and a digital readout. Practice with your provider to make sure you are taking your blood pressure correctly. It is normal for your blood pressure to be different at different times of the day. It is most often higher when you are at work. It drops slightly when you are at home. It is most often lowest when you are sleeping. It is normal for your blood pressure to increase suddenly when you wake up. 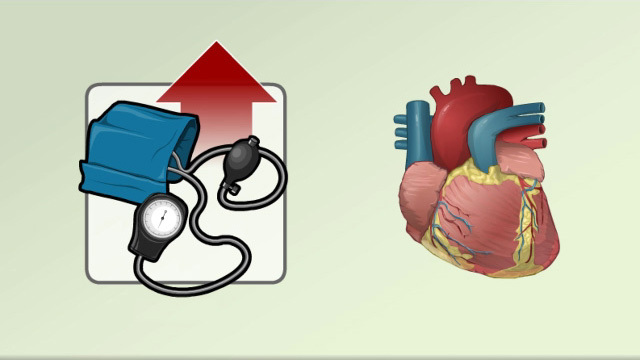 For people with very high blood pressure, this is when they are most at risk for heart attack and stroke. 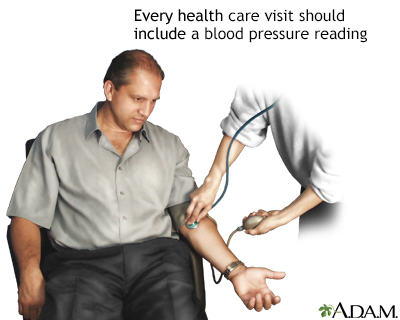 Your provider will give you a physical exam and check your blood pressure often. 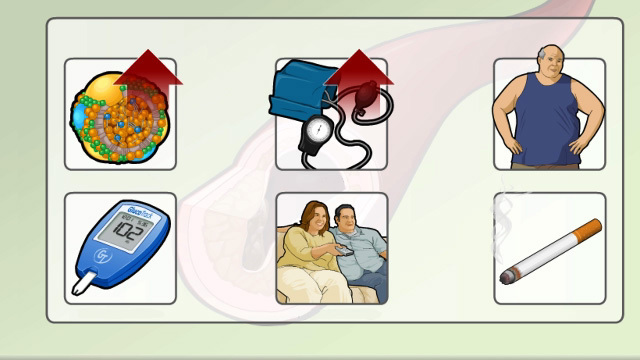 With your provider, establish a goal for your blood pressure. If you monitor your blood pressure at home, keep a written record. Bring the results to your clinic visit. Call your provider if your blood pressure goes well above your normal range. Ettehad D, Emdin CA, Kiran A, et al. Blood pressure lowering for prevention of cardiovascular disease and death: a systematic review and meta-analysis. Lancet. 2016;387(10022):957-967. PMID: 26724178 www.ncbi.nlm.nih.gov/pubmed/26724178. Rosendorff C, Lackland DT, Allison M, et al. 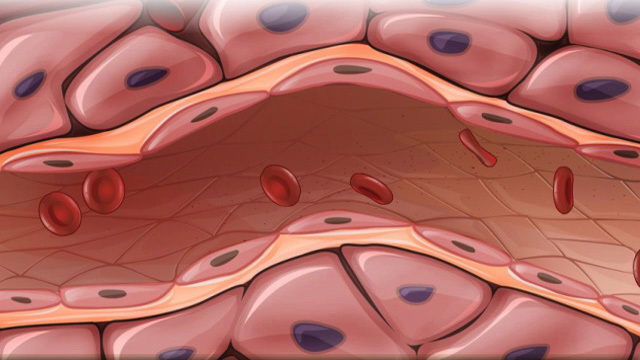 Treatment of hypertension in patients with coronary artery disease: a scientific statement from the American Heart Association, American College of Cardiology, and American Society of Hypertension. Circulation. 2015;131(19):e435-e470. PMID: 25829340 www.ncbi.nlm.nih.gov/pubmed/25829340. Whelton PK, Carey RM, Aronow WS, et al. ACC/AHA/AAPA/ABC/ACPM/AGS/APhA/ASH/ASPC/NMA/PCNA guideline for the prevention, detection, evaluation, and management of high blood pressure in adults: a report of the American College of Cardiology/American Heart Association Task Force on clinical practice guidelines. J Am Coll Cardiol. 2018;71(19):e127-e248. PMID: 29146535 www.ncbi.nlm.nih.gov/pubmed/29146535.